I love eggnog! It's one of my favorite holiday traditions. You can't go through December without having a glass of the good stuff. When the Smitten Kitchen blog posted an eggnog florentine recipe I knew that Patrick and I would be making it! I bet you're familiar with florentines. They're a sweet, light lacy cookie. Wikipedia tells me they are "made from setting nuts (most typically hazel and almond) and candied cherries into a caramel disc, which is then often coated on the bottom with chocolate." In this particular recipe, which is adapted from a Hillsborough, NC chef (another reason I wanted to make them! ), the florentine is made with pecans and does not contain candied fruits or chocolate. An eggnog filling takes the place of those items! Smitten Kitchen has detailed photos along with the recipe. Click here for the post! Eggnog Florentines for a party! We made these before going to an oyster roast! Unfortunately we were rushing out the door when these were finished so we forgot to get a good picture. I snapped one with my phone after we arrived at the party. Everyone seemed to rave about them! Some referred to them as "creme brulee desserts" so the flavor profile of the cookie is similar to that. The recipe does make a lot so either halve the recipe or take them to a party! 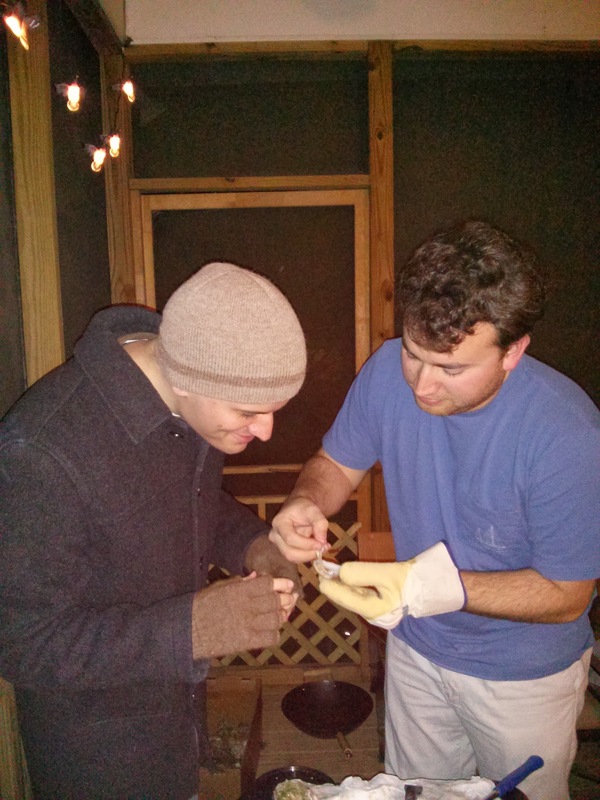 The Fox Family hosted a wonderful oyster roast and seafood boil! 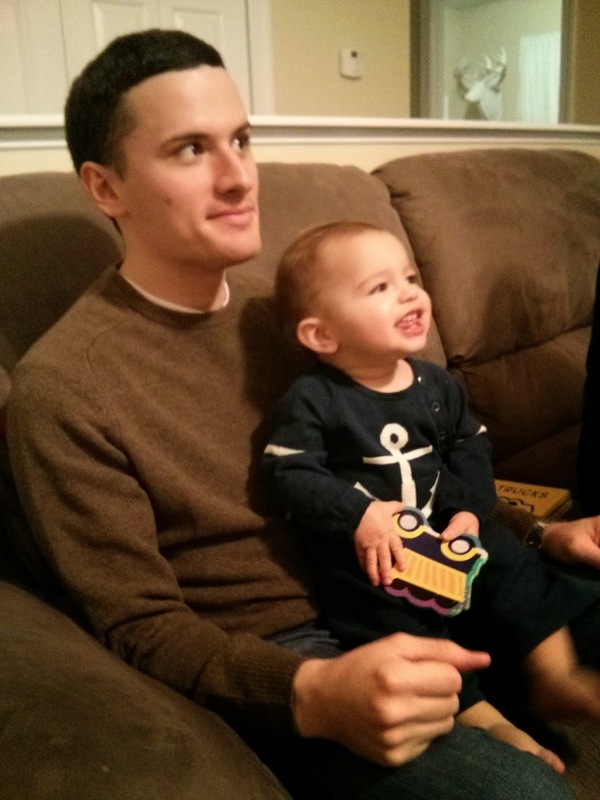 Patrick enjoyed reading to their toddler JR and he had his very first raw oyster! He's on his way to becoming a bonafide southerner! Patrick and JR reading about trucks and watching some basketball. Bryan showing Patrick how to extract the oyster! Thanks Fox Family for hosting a fabulous party! We look forward to the next one. We've mentioned in past CSA related posts we like to try new things. We made this spaghetti squash with spicy meat sauce recipe with our first spaghetti squash. We weren't quite pleased with how the spaghetti squash was roasted and wanted to try again. That particular recipe had called for you to roast the spaghetti squash cut side down. We found that this way retained a lot of moisture and the spaghetti squash had a lot of water in it. For our next spaghetti squash we wanted to roast it cut side up. I found a recipe from Pioneer Woman that put a completely different spin on the vegetable and I thought this would be a great way to try spaghetti squash for our second attempt. Read on for the recipe and be sure to go to her website for more pictures and details (website hyperlinked in recipe title below). Cut squash in half. Scoop out and discard seeds and slimy pulp. Scrap out the rest of the squash with a fork. Place in a bowl. Keep warm. In a large skillet, melt butter. Cook shallots over medium heat for 2 minutes or until soft. Reduce heat and add maple syrup. Cook for a minute, then remove from heat. Stir in salt. Pour mixture over squash. Sprinkle on nutmeg and mix together gently. Serve warm. We served the spaghetti squash as a side with bbq pork chops. I didn't grow up eating oatmeal and I was always somewhat skeptical of it because it looks like sloppy goop (although I did often eat Cream of Wheat, another form of sloppy breakfast goop, but that was familiar to me). Therefore, Whitney was going to have to win me over on oatmeal, and that she did with this baked apple cinnamon version. It is certainly sweet, but not overly so, and the tasty cinnamon apples helped me look past the peculiar texture of the oats (which were admittedly delicious). This is a welcome addition to our weekend breakfast rotation. Mix together the apple, oats, raisins, sugar, cinnamon, nutmeg and salt. Stir in the melted butter and pour the mixture into an oven safe dish. Pour the two cups of milk over top and bake in a preheated 350 degree oven for 25-30 minutes or until most of the milk is absorbed. Sprinkle with a little extra cinnamon, drizzle with a little bit of milk and serve! Patrick and I bypassed a traditional basic pasta when we first attempted homemade pasta. Instead we went straight for something a little more challenging: making beet pasta for ravioli. That wasn't too hard and really tasty! For our next pasta adventure we thought we should backtrack and make a simple egg fettuccine. That was a bit more challenging than the beet pasta! I think the reason was there are varying ratios of egg to flour floating around cookbooks and the Internet that it was hard to find the right consistency for the pasta. With the beet pasta recipe the amounts for everything were precise. We'll keep you updated when we find a pasta recipe suitable for blogging. For Christmas Patrick's family gifted us the KitchenAid pasta maker stand mixer attachment so we will definitely be brushing up on our pasta making skills! In the meantime enjoy this wild mushroom fettuccine recipe. You can certainly make it with dried pasta. It was delicious! In a large fry pan over medium-high heat, warm the olive oil. Add the pancetta and sauté until brown, about 2 minutes. Add the shallots and thyme and sauté until the shallots begin to brown, about 4 minutes. Add the mushrooms, season with salt and pepper and sauté until tender, about 5 minutes. Add the broth and simmer until syrupy, about 3 minutes. Meanwhile, bring a large pot three-fourths full of salted water to a boil over high heat. Add the pasta, stir well and cook until just tender, about 8 minutes for dried pasta or 4 minutes for fresh. Drain the pasta and add to the mushroom mixture. Stir over medium heat until coated, then stir in the cheese. Taste and adjust the seasonings with salt and pepper. Divide the pasta between 2 warmed shallow bowls. Sprinkle with parsley and serve immediately. Is there a recipe you're trying to master in the kitchen?? Yesterday we shared a sweet potato soup recipe and a quick breakdown of what items (pork items to freeze and root vegetables/winter squash) from our CSA box we stocked up on at the end of the season to tide us over into the New Year. This recipe was made with one of those butternut squash that we kept around. It's nice to be able to have the vegetables even after the farm has gone into winter hibernation. We've made butternut squash risotto a few times now and love it so I knew this recipe would be a winner when I ran across it. The roasted mushrooms were a last minute addition because a) they were in the fridge and b) I thought it would be good for the dish to have a bit more protein since it was vegetarian. Read on for the recipes. Place squash in a greased 15-in. x 10-in. x 1-in. baking pan. Drizzle with oil; sprinkle with salt and 1/8 teaspoon pepper. Bake at 400° for 15-20 minutes or until tender, stirring occasionally. Meanwhile, in a small saucepan, heat broth and keep warm. In a large nonstick skillet, saute onion in butter until tender. Add orzo and garlic; cook and stir for 2-3 minutes. Carefully stir in 1 cup warm broth. Cook and stir until all of the liquid is absorbed. Add remaining broth, 1/2 cup at a time, stirring constantly. Allow the liquid to absorb between additions. Cook until risotto is creamy and orzo is almost tender. (Cooking time is about 20 minutes.) Add the herbs, cooked squash and remaining pepper; heat through. Garnish with cheese if desired; serve immediately. We garnished with this roasted mushrooms recipe below! The mushrooms are mixed with two of Patrick's favorite things: balsamic vinegar and dijon mustard. In a bowl, toss all ingredients together. Spread on a rimmed baking sheet in a single layer. Bake for 10 minutes, toss with a spatula or spoon, and bake for 5-10 minutes more or until cooked through and golden brown. Serve hot. Even though our CSA has ended for the winter (it will start up again in April) we still have a few root vegetables (sweet potatoes) and winter squash (butternut) hanging around. When the CSA was ending we knew we would be travelling for the holidays and would need to be mindful of what items we were getting in our box. Our CSA offers pork products (ground pork and sweet Italian sausage are some of our favorites) that we will order and freeze. But we didn't want too much frozen pork so we opted for some sweet potatoes and butternut squash that we would be able to store and enjoy after the holidays. So we've got a bunch of sweet potatoes hanging out in the laundry room! I asked Patrick for a suggestion to help with weekly meal planning. His response was "ground chicken soup" which led me to scratch my head and wonder what he was thinking! I decided to put "sweet potato" and just "chicken" together for a google search to find this wonderful soup! It was delicious and I think we're both looking forward to having it again. Heat the oil in a large saucepan over medium-high heat. Cook the onion for 5 minutes, stirring occasionally, until lightly browned. Stir in the garlic, curry powder, and ginger. Cook for 1 minute or until fragrant. Stir in the carrots, sweet potatoes, and 3 cups of the broth. Bring to a boil, reduce the heat to low, cover, and simmer for 20 minutes or until the carrots and sweet potatoes are tender. Transfer to a food processor, working in batches if necessary. Puree the hot mixture until smooth. (We left everything in the pan and used our immersion blender.) Return to the saucepan and add the spinach and the remaining 1 cup of broth. Bring to a simmer. Remove from the heat. Divide among 4 bowls and top with the chicken (since we had leftover chicken from the refrigerator I put it in the soup pot to warm up a bit). Sprinkle with freshly ground pepper to taste. Do you have any "out of the box" recipes for sweet potatoes? "Eat Drink and Be Merry" was my theme for Patrick's Christmas gift. I worked closely with our wedding photographer Carol Hedspeth to commission a small piece of artwork for the kitchen and then filled in with some coordinating purchases from Etsy. I was so pleased with how everything came out! Read on to see the details of the various gift items. Carol designed this 6"x6" metal artwork. She took my inspiration and created this piece that we will showcase in our kitchen (it's actually hanging out with our china now) as a reminder to guests to "Eat, Drink, and Be Merry" while you are being entertained in the Eibl Kitchen! I emailed Carol some of the Esty items I would be pairing with this and she was able to use similar fonts to coordinate with the recipe box. At first my idea was just to use the picture of the rings on the forks with some other kitchen quote but then the quote emerged as "Eat Drink Be Merry". Since the forks so obviously represent "Eat" I thought "Drink" should be represented too. And one of Patrick's favorite parts of the reception was drinking champagne out of his Lismore flute. Next I thought Patrick would enjoy a recipe box for some of his favorite recipes that aren't in a cookbook. His deep dish pizza recipe is a good example of what will be in the box. The Etsy artist was fabulous to work with. She allowed me to customize the box. The original artwork had a chef's hat above "Eat" but I thought that would kind of distract from my theme in the other gifts. Furthermore her template for the top of the box was to have the lid read "From the kitchen of <insert name>" but I wanted "The Eibl Kitchen est. 2013" on the lid and she had no problem doing that. If you need a recipe box then I would highly recommend her shop! She has various designs as well. We always seem to be reaching for a clean kitchen towel so I couldn't pass up this "Eat Drink and Be Merry" flour sack towel. I've also read that the flour sack cotton material is good for drying china and crystal. Can't wait to give it a try! With all of our entertaining it can't hurt to have an extra serving spoon on hand! I thought this would be a fun addition to potlucks and parties. Hopefully our future guests won't forget to "Eat Drink and Be Merry" when they're visiting! Patrick and I recently cut cable. Ultimately we decided that the majority of the shows we watch are on broadcast television (hello ABC, we love watching your shows) and thought saving some extra bucks each month would be a nice benefit. We actually put some of that savings to Netflix so we can watch shows through the Xbox. I occasionally enjoyed some Food Network programming but there wasn't a series I watched consistently. If I was home with nothing to do I would see what it was showing and see if I could find inspiration from the Food Network chefs. ABC's The Chew is now filling that void for me. I've set this daily show to record so I won't miss a second! It's such a wonderful show and I find myself wanting to make something from each show; hence, I am not missing Food Network! The show is hosted by Clinton Kelly, Michael Symon, Carla Hall, Daphne Oz, and Mario Batali. They each have different personalities and strengths so the show is really amazing! It airs at 1pm; go watch it! This particular recipe is made by Daphne Oz who is the resident health and wealthness guru. Here she is lightening up the traditional alfredo sauce by using cauliflower as the base! Read on for the recipe. Place the milk and the cauliflower in a large sauce pot and season with salt and pepper. Bring up to a boil and reduce to a simmer, cover and cook until fork tender, about 8 to 10 minutes. Using a slotted utensil, transfer the cauliflower to a blender. Add the milk to make a creamy puree. Add the butter and continue blending until smooth. Taste and adjust seasoning. Bring a large pot of water to a boil and season generously with salt, so it tastes like the ocean. Cook the pasta one minute less than the packaged instructions. While the pasta is cooking, place a large saute pan over medium heat and add 1 to 2 tablespoons of olive oil. Add the shallot and season with salt and cook for 2 to 3 minutes, or until slightly tender. Deglaze with the white wine. Reduce by half, about 1 to 2 minutes. Add the cauliflower puree and loosen with about 1/3 cup of pasta water. Remove the pasta from the water and add it to the cauliflower puree, then grate fresh nutmeg over the top. Toss again and add more cooking water if the pasta seems too dry. Add the Parmigiano and parsley and toss to coat. We also added some imitation crabmeat because it's one of my favorite things and lends itself to a creamy pasta dish. What are you some of your tricks for "lightening up" traditional heavy dishes?! It's no secret that I love all shows of The Bachelor franchise (The Bachelor, The Bachelorette, and Bachelor Pad). For the past ten months ABC has been withholding my favorite show!!! And now finally it is airing again! For the first time ever the featured Bachelor is of Latin descent. Juan Pablo, who hailed from the last Bachelorette season, is the leading man! Since I was finding myself particularly excited about the premiere I decided to make a Venezuelan dish to honor Juan Pablo's heritage. Well I browsed around the Internet quite a bit and decided that Venezuelan entree dishes were too hard and complicated for me! I was interested in a cornmeal pancake, called arepas, but in Venezuela they are made with a precooked, ground flour which can be only purchased in specialty stores here. And since I wanted to be authentic I passed on the arepas. So then I moved on to researching desserts! And found that dulce de leche, which is the caramelization of sweetened milk, is quite popular in Venezuela! My loving husband watched The Bachelor with me (without bribery) so to reward his willingness to watch Juan Pablo hand out some red roses, I decided to drizzle the dulce de leche on apple crumbles which are one of his favorite crisps. Read on for both recipes! There are various methods for making dulce de leche; follow the hyperlink in the recipe title to read the full post on the other methods. I used the oven because I was bit pressed for time (next time I want to use the crockpot which I saw on other website). Empty the contents of a can into an oven-proof dish (I used an 8x8 Pyrex dish); sprinkle with some kosher salt (forgot to do this) and tightly cover it with foil. Place the covered dish in a larger roasting or casserole pan and fill it up with water until it reaches three quarters of the up the covered dish to create a water bath. Bake at 425 degrees F for 60-90 minutes checking every 30 minutes on the water level and adding more as needed (my water level did not change much). Dulce de leche is ready when it takes on a brown and caramel-like appearance. Remove from the oven and whisk to smoothness. Let cool before storing. For crisp topping: Place oats, flour, sugar, cinnamon, and brown sugar in a mixing bowl and stir together. For filling: Toss apples with lemon juice and 1/2 teaspoon cinnamon (we prefer pumpkin pie spice). Split apples into two small ramekins. Divide crisp topping and spoon over apples. Drizzle melted butter over each ramekin. 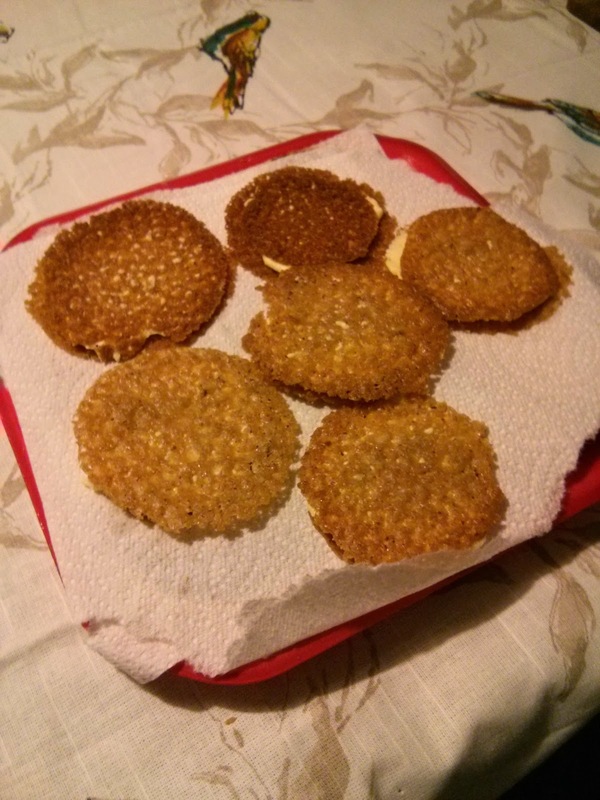 Place crisps onto a baking sheet and bake for 20 to 25 minutes or until golden brown. Serve with vanilla ice cream and a drizzle of dulce de leche. 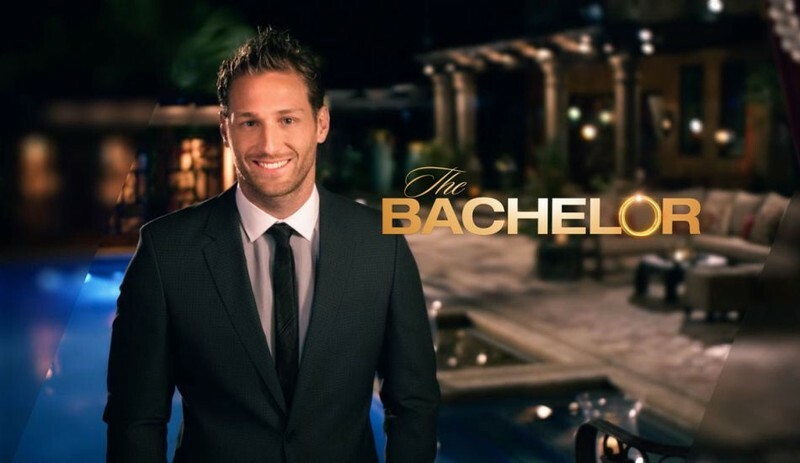 Are you rooting for Bachelor Juan Pablo?? I briefly mentioned in an earlier post that a) there would be some holiday posts throughout January and b) in the few weeks before we left for visiting family we were utilizing items in our freezer and pantry. Like I said in the introduction everything I used for this dish we already had on hand. The ground pork and cabbage were both hanging around from our CSA. The carrots were from Thanksgiving and the soba noodles were originally purchased for this dish. Soba noodles come packaged in sets of 3. Each set is a good portion for both Patrick and myself so that typically means I can get three meals from a package of soba noodles. If the noodles are the main ingredient and we know we want leftovers I may use two sets. This dish with ground pork, carrots, cabbage, and soba noodles morphed into somewhat of an Asian stirfry. Originally I was going to make a porkloaf and have couscous with steamed cabbage as a side. But then Patrick texted me at the end of the day that he was hungry and wanted supper soon after he got home so that nixed the porkloaf which would've taken over an hour and a half to prep and cook. This dish came together in less than 30 minutes and I actually had it ready from the time Patrick texted me to when he got home! In a large pan brown ground pork. Once browned, remove grease from pork and set aside. While pork is browning, warm olive oil in a medium pan and add sliced carrots. Meanwhile boil water and cook soba noodles according to directions. After the carrots have softened (5-7 minutes) I added 2 tablespoons honey ginger vinegar to the pan (white wine vinegar would work fine) and 3-4 tablespoons soy sauce. Then I added the chopped cabbage and put a lid on the pan so that the vinegar and soy sauce would steam the cabbage. After the cabbage has steamed add this veggie mixture and the drained soba noodles to the pork. Stir everything together and keep over low heat to let the flavors come together for a few minutes. Do you have a go-to pantry meal?? This is a quick throw back post from before wedding planning blog days. Our plates will always give us away. This month you will be seeing some random holiday dishes, hopefully we're all through with the Red / Yellow / Teal Target dishes from Patrick's bachelor apartment, and then we'll back to the Denby stoneware and white bone china dishes. Read more about our current dinnerware here and holiday pattern here. 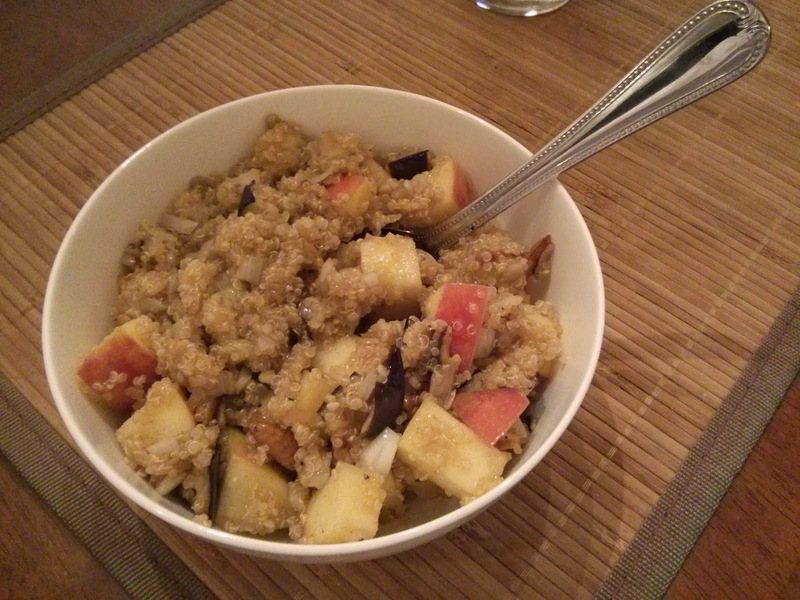 I insisted on blogging this post because it was a really good recipe! It's from our favorite series of cookbooks: Food Made Fast from Williams-Sonoma. We had a few friends over when we made this so it's great for entertaining and slightly more impressive than just a baked chicken breast. Season the chicken generously with salt and pepper. In a large fry pan over medium-high heat, melt 2 Tbs. of the butter. Add the chicken and cook, turning once or twice, until golden brown on both sides, about 8 minutes total. Transfer the chicken to a plate. Melt the remaining 1 Tbs. butter in the pan over medium heat. Add the onion and sauté until barely softened, about 3 minutes. Add the mushrooms and sauté until their juices are released, about 5 minutes. Stir in the Madeira and Worcestershire sauce. Return the chicken and any juices from the plate to the pan and spoon the mushrooms over the chicken. Cover, reduce the heat to medium-low and braise the chicken until opaque throughout, 20 to 25 minutes. Stir in the tarragon and season with salt and pepper. Divide the chicken among dinner plates, spoon the mushrooms over the chicken and serve immediately. We served this atop egg noodles and with steamed cabbage. Patrick and I have really enjoyed our breakfasts throughout the month of December! We had quiet weekends here in Durham and then he was fortunate enough to have about a week and a half off around Christmas and New Year's which meant more breakfasts to savor together! We made his favorite buttermilk waffles with fresh strawberries, baked oatmeal (recipe to come), and an apple pumpkin dutch baby. When we were in Murfreesboro Mom had a new sweet roll recipe for Christmas breakfast too! Before we left for our holiday visits I had a goal to use what we already had on hand. Buttermilk is in the fridge fairly consistently, we had some apples leftover that family had shared with us, and lastly there was some whipped cream. Put these all together and you have everything you need for pancakes with sauteed apples! After we had the apple pumpkin dutch baby I knew that I wanted to make something like this. For that dutch baby the sliced apples went into the batter and I didn't really like the texture of the apples. We loosely follow a recipe similar to this for pancakes. While Patrick was in charge of the pancakes I worked on the apples! While slicing the apples I melted about 2 tablespoons of butter in a small pan on medium heat. To the melted butter I added the apples, a dash of cinnamon, and a spoonful of brown sugar and stirring occasionally. These cooked while Patrick finished the pancakes (maybe about 5-7 minutes). To the pancakes we sprinkled a little powdered sugar, added the cinnamon apples, and topped with whipped cream. What's your favorite topping for pancakes?? Have you ever fallen victim to the over ripening banana?! Who hasn't?! When Patrick and I got back from our holiday travels we did some grocery shopping. Poor Patrick got stuck with me as we hopped from one store to the other. I put together a meal plan for a little over a week, and since we left the fridge fairly bare before we left for our trips, we needed to restock! After I made the list I divided into where we could get the best bang for our buck and off we set for Costco, Trader Joe's, and then Harris Teeter. At Costco we purchased produce items that we would use frequently in our upcoming meals (onions, bananas, avocados, and mushrooms to name a few things), next we went across the street to Trader Joe's for a few staples that are consistently priced better here (pasta and cheese mainly), then we finished everything else at Harris Teeter! We got bananas in bulk at Costco in preparation of smoothie making. We ate a few fresh as afternoon snacks and then two bananas were left hanging through the week. Finally I decided it was time for these over ripening bananas to be in some banana muffins. Even though Patrick doesn't like banana bread I made this with the intention of freezing them and having muffins whenever I would want one. But I think he liked them! I wanted something a little healthier than the last banana muffins we made so I did some googling and found a Betty Crocker recipe to loosely follow. The recipe calls for a cinnamon topping with melted butter but I omitted that. I also subbed in some whole wheat flour and replaced the oil with apple sauce! As an added flavor bonus I swirled in some molasses. Heat oven to 375°F. Grease bottoms only of 12 regular-size muffin cups with shortening or spray, or line with paper baking cups. In medium bowl, beat 2/3 cup sugar, the oil and eggs with wire whisk. Stir in bananas and vanilla. Stir in remaining muffin ingredients just until moistened. Divide batter evenly among muffin cups. Bake 17 to 21 minutes or until toothpick inserted in center comes out clean. Immediately remove from pan to cooling rack. In small bowl, mix 1/4 cup sugar and 1/2 teaspoon cinnamon. Dip muffin tops into melted butter, then into cinnamon-sugar. Serve warm. Fill muffin cups 3/4 full and bake in a preheated 375F oven for ~18 minutes or until toothpick inserted comes out clean. Enjoy muffins! I think the molasses really takes them over the edge. To ensure that Patrick would like them, I served one warmed for dessert with ice cream. Do you have a favorite banana muffin / bread recipe? Back in the middle of December Patrick had his holiday concert and his mom visited! You can read about it all here. We knew it was going to be a cold weekend. Since Patrick had his concert we knew we might be a little rushed for time on Sunday evening therefore I planned a nice pot of chili that we could have simmering on the stove. We started this late afternoon and it was just what everyone wanted on a cold Sunday evening before some classical music. Read on for the recipe and our impromptu chili bar. and everything was topped with your choice of avocado, cheddar cheese, sour cream, and sliced jalapenos. What are your favorite toppings for chili?